Set in a serene and tranquil countryside close to Suvarnabhumi International Airport in Bang Chalong district off Bangna-Trad Highway (KM 18), this 18-hole paradise has all the prerequisites to become the city’s hottest destination for four hours of excitement and fun-filled golf, spiced with a buffet of challenges, risks, surprises and rewards! Just a half-hour drive from downtown Bangkok, Lakewood Links is located on Wat Sriwaree Noi Road, 4.2 km off the highway and is. 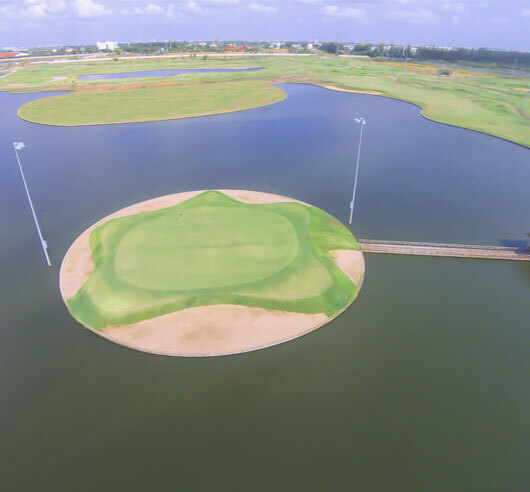 It’s been aptly named ‘Lakewood Links’ since its terrain reminds one of a ‘linksland’ characterised by undulating sandy grounds dotted with bushy dunes and water bodies.